It’s been such a busy time. I’ve noticed that the things I didn’t get around to in the past few years are the same things I didn’t get to this year either. I even went so far as to put the cards I bought last year out on my dining room table (among the temporary home of the Polar Express set at the North Pole, courtesy of my son.) I looked at the bag nearly every night. I passed the bag often on my way to: working for a living, working on Christmas gifts for my elderly friends, writing poetry, journaling, breathing, watching Christmas films with my family and endless episodes of “Antiques Roadshow”. My husband is a bit addicted to the show! Alas, the bag didn’t get put into use. Maybe next year. Losing X number of pounds by Christmas. Learn to stop getting annoyed at a second’s notice and popping my cork. Well, I’m still menopausal, so I don’t really suppose this one is a realistic hope until that phase of my life is finished. How much it’s got to do with it, I’m not sure, but that’s my story and I’m sticking to it. Actually, if I really think about it, I have probably made a wee bit of progress in this area. Or I’m deluding myself and I’m still a nasty old bat! Have my life all together and be the picture of total contentment. I’m sorry, I was so busy laughing at the notion of this last one that I forgot to keep typing. I’ve come to the conclusion that as long as I breathe on this earth, I’m going to remain a human and continue making mistakes at the rate of about 1,000 per day. The good news is: God has my back and He’s nowhere as clueless as I am! Remember to send out Christmas greetings on time. My Christmas wish for you is that whoever you are, whatever you believe, and wherever you are in life at this time; I wish for you a very Merry Christmas, peace in your heart, discernment for God’s will in your life, family and true friends to support you and cushion the ride when life gets bumpy. And it will. As long as you’re breathing and taking up space on this planet, it will. But just like for me, God’s got your back if you let Him. Now THAT’S an awesome thought at Christmastime. 9/1/11 Day 1: Little Brothers Birthday Visit tonight. 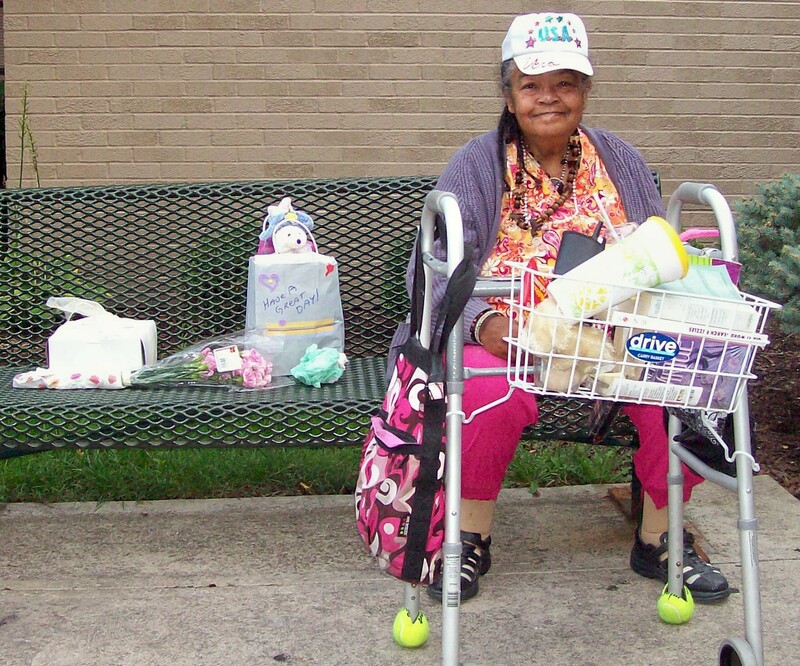 The residents at Booth Home were really gracious. 9/2/11 Day 2: The kindest thing I did today was spray lots of air freshener in the ladies room. TMI. I’ve been thinking of ways to show myself deliberate kindness. That’s not something I’m naturally good at. I’ve been trying to exercise a little more, letting a friend encourage me to try something new (more details on that as it plays itself out), and trying to make sleep more of a priority (Miss Sue is definitely a Supremely Hardheaded Lunkhead when it comes to giving herself enough sleep). A few more events have transpired. Some fun, some ….. not worth writing about. 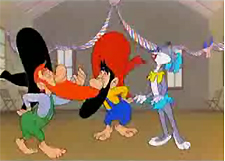 Image via Wikipedia : "Hillbilly Hare" Courtesy of Bugs Bunny! Oh wow! I looked up images of hillbillies to see if I saw a photo of me. This is one I found…. wasn’t this a great Bugs Bunny cartoon?! One of my favorites. If my brother Jon is reading this, do you remember this one?! Here’s a birthday visit to Marvin on September 21st. I have to tell you, this was one of the funnier and more lively visits I’ve done! Marvin loved to tell stories of his stunt work with Hollywood movies, meeting Roy Rogers when he was 6 and getting to ride on Roy’s horse with him as Roy rode around Crosley Field, being friends with Diana Rigg (the “Avengers”actress) many years ago, naming his favorite dog Emma Peel, liking marriage so much he tried it five times (!). 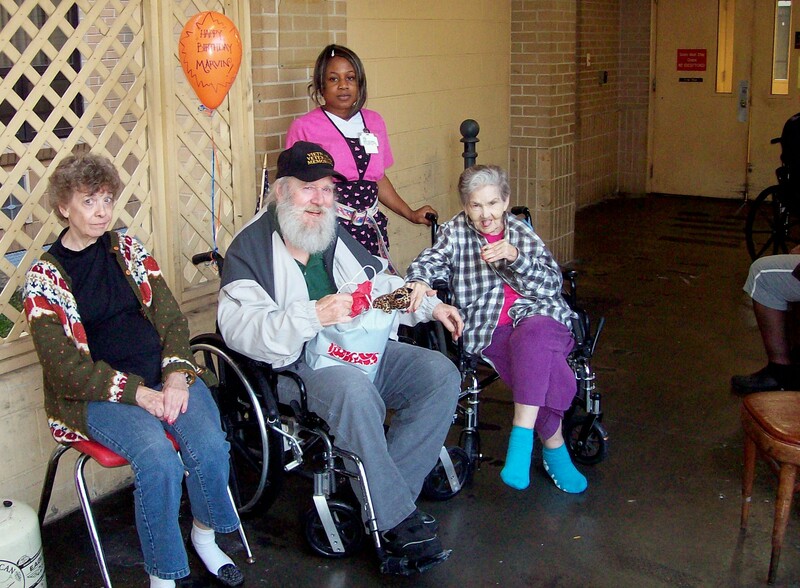 Apparently he’s still a hit with the ladies today, as he regularly goes outside for his smokes with his buddies: Shirley, the other Shirley, and Cora. I told him with his connections in Hollywood, we should pitch a script for a new “Charlie’s Angels” – “Marvin’s Angel’s – the Westwood Version”. They were all up for it! If you look at the photo on the left, Marvin enjoys the camera – look at that smile. 🙂 This was his first birthday visit from Little Brothers: I told him that gave me a lot of pressure to make it a great one. 🙂 It WAS a great one, but it wasn’t me. The ladies obviously care about Marvin a great deal, the staff member seen in the left photo had the most beautiful accent and was fun to talk to, they all fussed over Marvin and his cake, his flowers and bag of presents. He loved the stuffed animal and showed it off frequently. I just told jokes and had them all laughing. Marvin and his Angels: Shirley on the left, Cora on the right and the other Shirley just visible on the far right. Oktoberfest Zinzinnati has been an annual celebration in Cincinnati since 1976. I’ve never missed a year. I wish I could tell you I did all kind of deliberate acts of kindness down there. I DID spend lots of money, that was kind, I suppose! But Oktoberfest turns me into a bloodhound! I am in search of one thing: a Schmidt’s Jumbo Cream Puff. It is the gastric highlight of my year. 🙂 And, here’s a page that might be taken from, You Know You’re A Redneck When. Most people splash out money on their yearly family portrait from wherever families go for those things. Not my family! You can’t get me to dress up & our version is a little closer to reality. 🙂 We take our yearly photos at Oktoberfest! I have a photo of Kevin each year, except he’s not usually standing, so you can’t tell how tall he’s gotten. He’s hunched over his own cream puff, scarfing away! My birthday is now five days away. I can’t say the experiment I proposed to do has made it feel more significant. I still miss my mom and dad and those electric purple roses on chocolate cakes with white icing from Bonomini Bakery. I still get a little melancholy about people who are gone from my life. That’s the way I’m wired, I’m afraid. Doing nice things does take my mind off of myself and the sad feelings. It makes me feel like less of a slug as a human when I’m helping someone else out. Time to round it all up and see what I think. I performed an act of kindness on Monday September 26th. That was the day of the wicked nasty storm in the early morning. Having pity on my son, I drove him to school. Must tell you, Columbia Parkway during a storm like that is NOT for sissies! The intersection at Delta and Linwood by the UDF was positively nerve rattling; we were at the stop light in standing water and the gusher coming at us…. glad I’m not in need of those previously mentioned Depends just yet!! Greetings from as far away as England and as close as the home made card my son made with sentiments that included The Musty Pines Old Folks Home (!) (when did this kid get to be so much like me??) made my day festive. In 2011 good wishes come from the U.S. Postal Service, text, email, Facebook, homemade, telephone, in person. What a variety of ways people have to “reach out and touch” these days! Part of my day was spent on Fountain Square with Little Brothers Friends of the Elderly, handing out carnations and telling people about the great stuff LBFE does for the older population in Cincinnati. 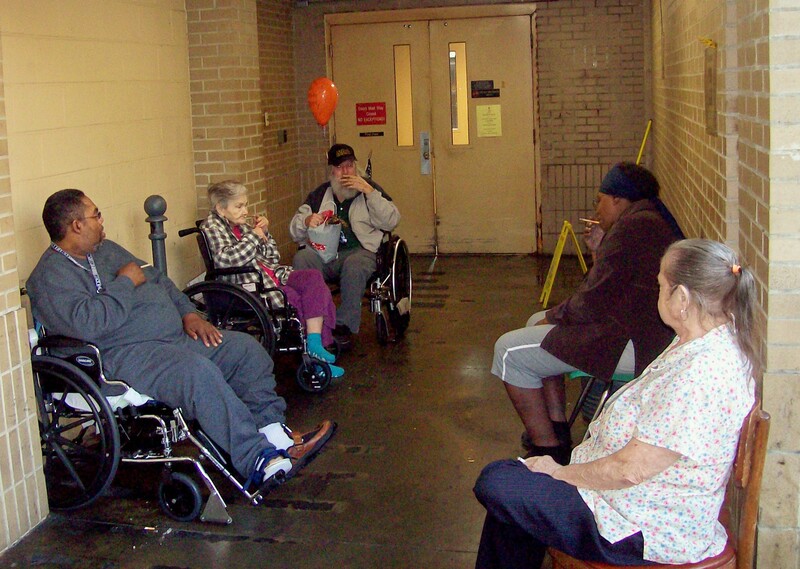 It was to celebrate International Day of Older Persons, which is October 1st. Sometimes, the most unexpected things can happen. The person who might look blase about hearing our objectives would actually be quite interested. I gave carnations to young, old, homeless, persons in business suits, lonely looking people, folks with a world of hurt etched on their faces. Some wanted to tell me their story, many wanted hugs, lots gave me good wishes for my birthday and beautiful smiles. This sometimes causes me to shake my head. I am a squirrely woman who appears to be trying out for Bag Lady of the Year awards. My fellow volunteers are attractive vibrant well dressed women. I always fear that people will run from the crazy squirrely bag lady chick with Completely Nuts on her t-shirt. But they seem to like my Squishiness. Maybe my Squishiness makes me feel safe to them, I don’t know. I had a 19 year old guy approach and ask me all sorts of questions. He kept appearing over the next half hour or so. I can only surmise he was drawn to my motherly side, I have no idea! The most endearing moment occurred when one of our elderly Friends – Nellie – found out it was my birthday and commenced to sing Happy Birthday to me. 🙂 Having no shyness about letting her voice ring out in song and her pure, simple act caused me to choke up. She then put her arms out for a hug and for just a whiff of a moment, I felt my mom’s spirit and it was pretty sweet. Oh, Fox 19 and Frank Marzullo were there filming relay races between mascots from UC, Xavier, Skyline Chili Dog and Gapper from the Reds. It was hilarious! Gapper is great. 🙂 I took a few pictures. It also gave me a nano second glance of myself in the crowd up on the Jumbo Tron. Oh dear! Which segues right into my blog focus for the month of October, but you’ll have to read the post next time for that! I’m putting a slideshow of photos below to show the highlights of the month. I tried to insert some of the photos and it just isn’t happening. Technology – pfftttt! Hello! Lot of life happenings this week. My son is settling into the new school year. I’ve mentioned driving over to the east side to drop him off… how I enjoy it. The different vibe, funky little shops, beautiful architecture, the variety of humans. People watching is one of my favorite pastimes. Observing a person’s eyes, their body language, pondering what their story might be. The repressed “Nancy Drew” inside of me can spin interesting theories and stories for quite some time while gazing at people! School is going pretty well. I think Kevin had one of those emotional growth spurts over the summer. He’s evolving into an interesting, creative, thoughtful young man. Thankfully, his interest in school has grown along with it. Touch wood when I write that! I read an article on the AOL page this week about a woman named Kim. http://www.huffingtonpost.com/2011/08/22/kim-focused-on-healthy-choices-and-lost-100-pounds_n_930927.html She’d had an AHA moment about her life when her overweight body caused the toilet seat she was sitting on to crack apart. It proceeded to do its own version of the Jaws of Life on her bottom and wouldn’t let go. This gave her an opportunity to reflect on things. 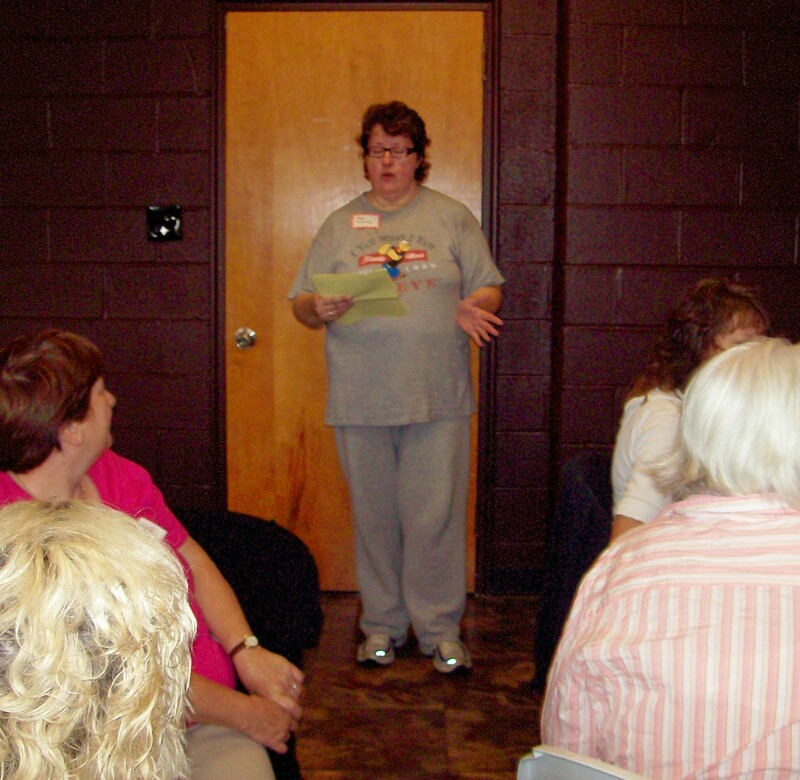 Her truly inspiring story got me to think about my state of health. I really don’t fancy the fire department coming to extricate my bottom from a broken loo seat! Maybe I should do something about MY health before I have to place such a call. This led me to write the earlier blog entry – “Confessions of a Couch Potato“, where I pondered why can’t I stick to a healthy lifestyle? I got interesting feedback here and via email. It caused my decision the next day to TRY and move my body, if even for a short time. After I did that, and saw that I didn’t vaporize from the effort, the page “Get Off The Couch Princess” was created on this blog, where I can publicly document the ginormous task of getting my body to move again. I’ve decided to leave my ego at the door, in the hope that being transparent will garner me a good supportive group of readers who will hold me accountable. Oh wow, here’s an interesting note. When I looked for a photo to show leaving your ego at the door, this image came up. It’s called ” “All is Vanity” by C. Allan Gilbert. Life, death, and meaning of existence are intertwined. 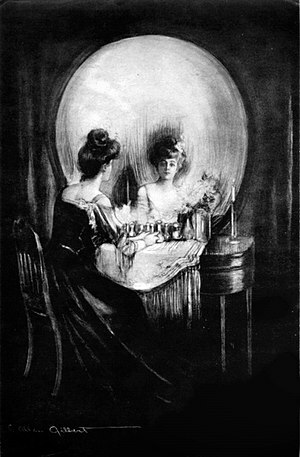 (Woman gazing into boudoir mirror forms shape of skull.) I think it’s a great picture to illustrate the deadly consequences of getting too wrapped up in your own importance. What else? I’m reading a variety of books at the moment. Being the distactable female that I am, I keep 3 or 4 going at any one time. The CoDA big book holds my interest currently; along with a Reader’s Digest. I started two different fiction books from the library, but neither held my interest long enough to finish them. I’m happy to write that an acquaintance is considering hosting a book club for the book “The Help”. I bought it at Target while doing back to school shopping a few weeks ago; it’ll be nice to read it along with other people. Let me post a few pictures here from Little Brothers Quarterly Birthday Party held on August 13th. Dig the birthday cake!